For most pro and semi-pro guitarists, one of the ongoing challenges is in building and maintaining a rig that ticks all the boxes musically. In the modern age of overwhelming choice this is a vast subject - and one of critical importance to both the player and those doing the booking! Unless you're one of the lucky few who are making a living solely out of their original music or who have a comfortable longterm seat on a major-artist gig, the reality is that both your style and your sound are going to have to remain malleable over time. Part of the picture for the majority of professional and semi-professional players are the session and covers scenes - which provide a fairly reliable source of work year-round but come with their own set of practical challenges. A simple answer in this enlightened time comes in the form of digital modellers like the Kemper Profiling Amp, Fractal Axe-Fx, Line 6 Helix and the ilk. These really can be all things to all men and with careful programming and some attention to detail on the monitoring side they are now getting close in feel and response to the real thing, especially in a studio environment. Some guitarists have moved over permanently to the digital realm, some have come back to real amps, and some have maintained an intelligent 'horses for courses' approach depending on the gig. However, there are many of us - players and producers alike - who still enjoy the sight, sound, smell and - most importantly - feel of a real tube amp rig. Putting together a professional-level tube rig that can approach the flexibility required while remaining reliable, practical and transportable presents a very specific set of challenges which need to be approached with a clear head! This might seem obvious and perhaps bordering on the banal; but you do need to think very carefully about the obvious stuff before getting too excited. How do you get to most of your gigs? How much space is there in front of and behind you? Are you generally being mic'd or do you need firepower? Which styles do you generally get booked to play in, and how loud or dynamic are the other musicians you tend to work with? Only you can answer these questions - but they are critical. If you play a lot in intimate settings with jazz, country or funk musicians, you could start with something like an open-backed 25W or 30W combo. This will remain sweet enough for the bar and lounge gigs, while giving you enough clout and clean headroom for the occasional rock/pop or fusion gig with a louder drummer - meaning that you can hear yourself clearly without needing too much help from the PA and that your clean sound remains as clean as intended in most situations. Perhaps you play a lot of pubs, parties and weddings with a range of function bands - each coming with its own setlist, its own PA system of varying adequacy, and its own set of priorities in terms of onstage monitoring. For this setting, something between 40W and 60W and perhaps carrying one or two 12" speakers would be more appropriate. This setup will remain sweet and unobtrusive enough for a more dynamic pop, funk or soul band (or perhaps an aggressive decibel limiter!) but will easily provide the authority, girth and definition required for classic rock and hard rock tunes. If you find yourself playing on bigger stages or on the occasional tour - perhaps in a rock context - but still need a rig that can be sweetened for a range of settings, it's a great idea to "split the difference" with a 2x12" rig that can be switched between 50W and 100W (remember, the extra watts are about clean headroom, feel, authority and projection - not necessarily volume). You could mate a multi-watt head or perhaps something with a built-in power soak to a closed-back 2x12" cabinet - maybe expanding to a 4x12" when the style or situation demands it. It's worth pointing out that master volume controls vary wildly in their effectiveness; some 100W amps will respond beautifully when turned down whereas some 50W amps - conversely - will sound neutered at anything other than big-stage volume! A great master volume control (like the one on Friedman amps) is a real boon in this situation. Having decided on a rough wattage, weight penalty and your onstage footprint, you need to think about your desired response. This is immensely personal and can be extremely style-dependent. Ultimately, only you know what kind of feel and core tonality makes the guitar feel right in your hands. Even if you are playing lighter, more dynamic styles that doesn't necessarily mean you need a sweet little combo. There are countless examples of some of the most sensitive players using a clean, loud power stage (perhaps even with stiff, clean high-wattage speakers like JBLs) and adding a range of pedals to give them the range of expression they need. Conversely, a cranked Vox AC30 can give an extremely loud and robust hard-rock sound (Little Angels or Queen, anyone?). At yet another end of the spectrum, a loud "rock amp" like a 100W Marshall can sound and feel very sensitive/musical in the right hands. A lot of this will also be dictated by your choice of guitar and pedals - if you want to run a clean channel on the edge of breakup, the wattage of your amp may be partially dictated for you by the amp's design. However, the breakup point of a "clean" non-master volume amp can still be altered by using speakers of different sensitivity or even running a (safe) impedance mismatch. This is a large and technical subject and can't be covered adequately here - but it's useful to know that if you like everything else about your 60W Fender and simply want it to break up/sweeten up as early as a 30W one, you have options. There are many good attenuators on the market as well; devices like the THD Hot Plate or Rivera RockCrusher will happily lop off 3dB, 6dB or even more without altering the glorious sound of your non-master volume Marshall too much. These units retain all the sweet sustain, canyon-wide dynamics and blistering attack of the heavy-duty power stage; but at club and bar-friendly volumes. This section is also extremely personal. For the player who relies on a "clean platform" amp for volume it can be a straightforward matter of mixing and matching a handful of pedals. Perhaps you could combine a natural-sounding low-gain pedal like the Wampler Euphoria, Paul Cochrane Timmy or Xotic RC Booster with a great mid-gain pedal like the Bogner Blue, Lovepedal Eternity E6 or Wampler Pinnacle. For your high-gain sounds, you could add a dedicated pedal like the Bogner Red, Friedman BE-OD or EVH/MXR 5150 - or consider stacking a simple booster pedal with your existing pedals. Something like the ubiquitous Ibanez Tube Screamer (or one of its many variants) is ideal for this job, but an MXR Micro Amp or even a cleverly employed graphic EQ can also be useful. The latter is often overlooked and gives almost infinite opportunities for both pre-and post tone-shaping as long as its noise floor is taken into account! The equation changes slightly for those players who like to run their amp at the edge of breakup (or even well into breakup) and roll off from the guitar for their cleaner sounds. These guys have the option of using pedals perhaps more subtly to effect a gradual variation of tone. Stacking clean boosts like the Micro Amp or a TC Electronic Spark Drive in front of your amp's distortion can give great low to medium gain results, but pedals like the Klon KTR Centaur, Catalinbread Dirty Little Secret, Fulltone OCD or even Boss's time-honoured DS-1 absolutely thrive at medium and even medium/high-gain in this environment. Once again, stacking two or more pedals in this manner can yield interesting high-gain results. For players who rely less on pedals and more on the channels of their chosen amp, the plot thickens. 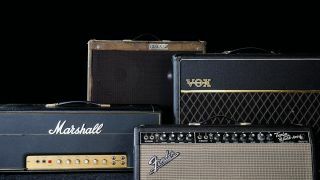 Much has been written about choosing the ultimate channel switching amp and for many of us it's an ongoing process (much like the pedal guys, in fact, but this time involving vast sums of money!). Before disappearing down the rabbit hole it's critical to assess which sounds you can't live without. For example, if a breathtaking clean channel and a world-class high gain channel are important to you, you could start by looking at a Mesa/Boogie Mark Series or even one of the newer Multi-Watt Rectifiers: a Suhr PT100, ENGL Powerball II, Friedman BE-50 Deluxe or one of the KSR offerings perhaps. These higher-wattage channel-switching monsters all have the power, flexibility and musicality to slot into any conceivable setting and might only need a tasty breakup or mid gain pedal added in order to cover all the bases. Perhaps you're a player who doesn't rely on clean sounds at all, preferring to live in the breakup and mid-gain realm - controlling sounds the old-fashioned way from the guitar. In this case, a simpler amp with a couple of excellent woody overdrive textures like the Marshall DSL, Mezzabarba Mzero Overdrive, Friedman Smallbox or Bogner Helios might fit the bill - perhaps combined with a Tube Screamer or clean booster to "fill in the gaps." Even a bare-bones Marshall JCM 800 2203/2204 can cover a wide range of styles with a couple of pedals and the right pair of hands - and often (but not always) a simpler amp produces more organic results and greater responsiveness overall. Having chosen an amp and cabinet configuration - and possibly a range of overdrive pedals - we now need to set about adding effects. Most pro or semi-pro players will need at the very least a basic chorus, delay and wah pedal to get through a range of booking scenarios. Players who rely heavily on clean sounds will no doubt want to employ a compressor or two - and perhaps a nice digital reverb. More rootsy players might find themselves in regular need of a fuzz, vibe or other front-end effects; and more modern or progressive-minded players will probably want a couple of different delays, a great flanger and perhaps some '80s-style micro-pitch shifting. It's relatively unlikely of course that any one player will be booked for all of these settings. In the end we all specialise to a degree - and there is often an element of tonal compromise in both live and studio settings. More often than not, vibe and musicality is more important than absolutely nailing every sound; and most successful pro and semi-pro players find they are booked for their particular approach as much as anything. Even with this in mind, though, by now most of us will have our 'dream pedalboard' taking up a lot of stage real-estate! The answer, as ever, lies in compromise. One approach is to simply trim down effects units to the ones you actually use regularly, and fill in the gaps with better playing, more dynamic awareness and greater stylistic sensitivity. People probably won't notice the missing Leslie speaker effect from the solo to Bon Jovi's Always, but they probably will book you again if you play spectacularly! At the other end of the scale, devices like the Boss GT-1000, Fractal FX8 and Line 6 Helix have now made integrated floor effects units an absolutely seamless and totally valid solution - rendering full-sized MIDI-controlled racks little more than a costly (if appealing) burden for all but the hardened touring pro. These integrated units combine high-end time-based effects with some stunningly realistic pedal and amp simulations; yielding a best-of-all-worlds setup that does literally everything to a professional standard; and all from one programmable box. The latest generation of these devices is becoming increasingly difficult to argue with - and with their built-in MIDI control, relay switching and (often) expression pedals they provide a tempting "halfway house" solution for those of us who crave the versatility and integration of a fully digital rig - but can't give up our real amps! Somewhere in between these two disciplines, one could build a hybrid setup - using perhaps one or more Eventide H9s, Boss 500 series pedals or TC Flashback units. This is a clever approach that utilises programmable or semi-programmable units for time-based effects in the FX loop; combining them with one or two tasty overdrives and perhaps a real wah out front. This can be a great all-round solution with a good balance of tonal versatility, form factor and vibe. The final stage, of course, is to combine everything into a rig that can be seamlessly switched, reliably transported, and tweaked/repaired along the way. For many players, working without programmable patches of some sort is simply impractical. To go from a screaming delay-soaked lead, to a clean sound with a touch of compression and chorus, and then to a dry mid-gain rhythm sound simply involves too many clicks! Fully programmable devices like the FX8 and Helix solve this problem - with only one or two control cables needed in order to channel-switch your chosen amp - but where does that leave the rest of us? In practice, many players will utilise a range of pedals in conjunction with a programmable pedal loop switcher (like TheGigRig, Musicom Lab EFX MkV, Boss ES-8 or Carl Martin Octa-Switch). This keeps the pedals out of your precious signal path while making their on/off status programmable per patch. This is a brilliant solution that does unfortunately necessitate a somewhat bigger 'board and a lot of connections. If you're not experienced at building your own pedalboards this is a great time to get a professional involved; they will normally be able to build you a board that is smaller and neater than you imagined - and it will pay for itself in reliability over time. For those of us relying to some extent on digital pedals like Boss's 500-series or Eventide's H9s, or for those who like to keep all their effects in a rack (a vast subject that sadly cannot be covered here), MIDI control is an excellent option. Companies like RJM, MarkL and Voodoo Lab build tour-ready controllers in a range of neat and relatively compact housings. At the bottom end of the scale, Behringer's ubiquitous FCB1010 controller is a very cost-effective solution that still represents an industry standard in MIDI control for many. Again, it's often worth paying to have your board professionally built at this stage as it will pay dividends in both form factor and reliability.